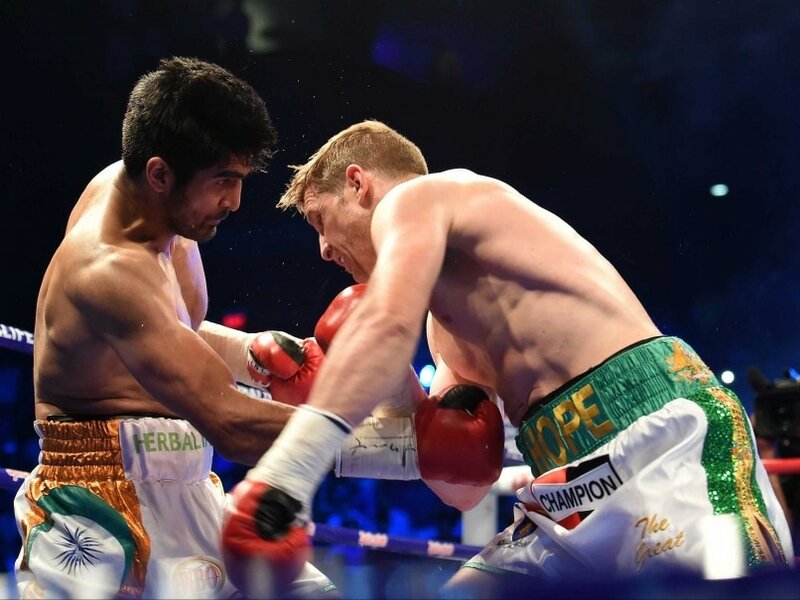 Indian boxing star Vijender Singh scaled a new high in his ever-soaring professional career as he clinched the WBO Asia Pacific Super Middleweight title with a dominating win over former WBC European champion Kerry Hope here on Saturday. The 30-year-old Indian took all 10 rounds to systematically dismantle the 34-year-old Welsh-born Australian and record his seventh straight win in the circuit, a year after turning professional. Tonight was also the longest that Vijender spent inside the ring to clinch a win since turning pro besides being his first points win after six knockouts. The six-footer from Haryana scored 98-92, 98-92, 100-90 to be the unanimous winner. Vijender, who as an amateur held the distinction of being India's first Olympic and World Championships medallist, was hardly pushed despite playing all 10 rounds, and was cheered deliriously by a packed partisan crowd. The Indian had the who's who of sports, politics and entertainment industry cheering him from the ringside and he put up a dominating performance to send the crowd into hysteria with his lethal right jabs and uppercuts. "It's not about myself, it's about my nation, my country," Vijender said after being crowned winner. Vijender Singh in action against Kerry Hope during their WBO Asia-Pacific Super Middleweight title. From Congress leader Rahul Gandhi to celebrated woman boxer MC Mary Kom, who choked a bit while acknowledging a loud applause from the crowd, star wrestler Yogeshwar Dutt, cricketers Virender Sehwag, Yuvraj Singh and Suresh Raina to actor Randeep Hooda, celebrities adorned the front rows by the ringside and Vijender did not disappoint any of them with yet another clinical performance in what was to be a 10-round contest. Vijender seemed to be looking for a knockout blow from the very beginning even though Kerry was the more attacking of the two. But the Australian's inability to connect cleanly proved to be his undoing against a rival, who waited patiently to throw his accurate blows. To his credit, Hope tried his best early on but just could not find a way to breach Vijender's defence, hampered to an extent by his shorter arms. The moment the final bell was sounded, Vijender's British trainer Lee Beard lifted him up to celebrate even before the decision had been announced, sending the crowd into a frenzy. "This comes after a lot of hard work put in by me, my trainer, my team. I thank my coach, my promoter and my team who have done a fantastic job. "I also thank all the fans, the celebrities and sportspersons who have come to watch my bout today. 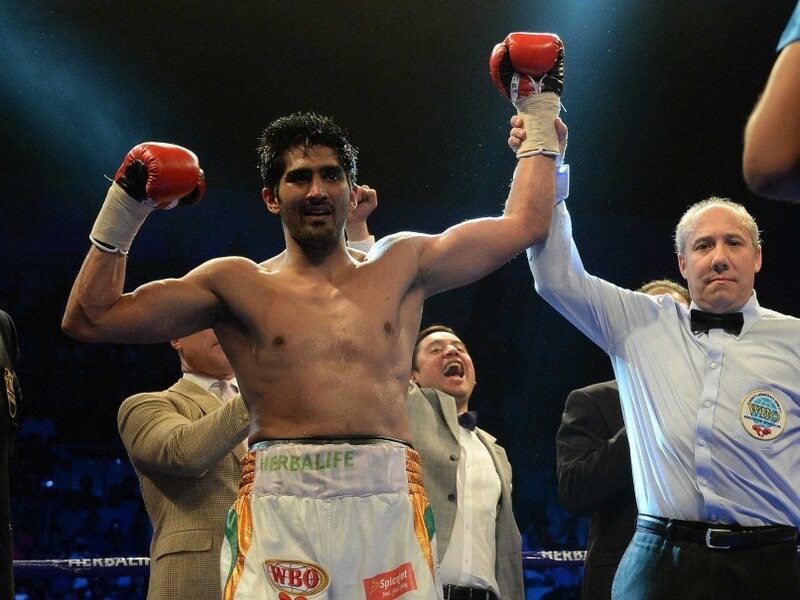 The countdown has just begun," Vijender said. Earlier, in the Indian Boxing Council's undercard bouts, Siddharth Verma of Maharashtra clinched the IBC Super Welterweight national title by beating Haryana's Dibagh Thakran, a former Commonwealth Championships bronze-medallist. The eight-round contest ended unanimously in Verma's favour. In the heavy weight division, Haryana's Sumit Rangi got the better of debutant Naveen Rao from Delhi in a six round contest. In the light-heavy category, Gaganpreet Sharma from Chandigarh prevailed over Deepak Sheoran in another six-rounder. There was drama in the super bantamweight contest in which former amateur junior world gold-medallist and Commonwealth champion Sunil Siwach made his professional debut. The Indian was up against Thailand's Natdanai Pegthong and stunningly had his opponent first on the knees and then on the mat within a few seconds of the opening round of what was to be a six-round affair. Pegthong was thrown off -balance by a stinging right jab and could not recover from the blow, giving Sunil a knockout triumph in his very first bout. Before the Vijender-Hope face-off, there was another India-Australia clash when the undefeated Cameron Hammond took on Devdarshan in a welterweight six-round bout. The Indian fought hard but still fell short as Hammond, who had participated in the 2010 Commonwealth Games here, scored a unanimous victory. But in a fine sporting gesture, Hammond raised his rival's hand after the results were declared to acknowledge the local favourite's fine effort. Another highlight of the evening was the four-round clash in Super Lightweight contest between Indian-origin Brit Sanjeev Sahota and Vikas Lohan. Sahota won the bout comfortably and had the crowd on its feet by acknowledging his Indian and Punjabi roots with a little gig to the beats of a Punjabi song before leaving the ring. The crowd was slow to trickle in but filled up by the time Vijender walked in to the now trademark tune of 'Singh is King'. In a special women's bout featuring boxers from Mary Kom's Manipur-based academy, Negeinihat defeated Bichong via a unanimous decision. Adding to the entertainment quotient of the night was a performance by Punjabi singer Guru Randhawa.